Finding a tutor is often a headache, especially when your test is only weeks away. Feeling stressed over an exam is not fun. You have probably realized that if you do not use a tutor, you may not be adequately prepared, but if you hire an unsatisfactory tutor, you may waste even more time and money. 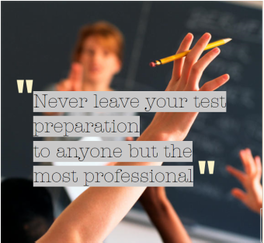 The goal of TPS is to provide you with the most professional test preparation courses throughout the world. Your tutorials will help you to study in the most efficient and focused manner. All teachers are certified and well qualified. We offer training for virtually every standardized test required in Canada. If you're a prospective university student needing IELTS, TOEFL, CAEL, LPI or CanTEST, we can help your performance. If you're a PR or citizen candidate needing CELPIP or IELTS study, we can help improve your chances. If you're a high school or middle school student struggling with SAT, ACT, CAT4 training, or provincial exams, we can get your prepared. If you're a person trying to obtain English proficiency requirements for nursing (CELBAN) business (TOEIC) or real estate (LPI), we can help put you in the right direction. Whatever the case, we have trained professionals ready to put together a tailor-made program. ​Lessons are taught by a top professional in the field: a teacher with over 20 years of experience in teaching test preparation, MA in Applied Linguistics, BEd, TESL diploma (credentials available upon request). We conduct both home and online tutoring. We only use official materials in lessons. We do not sell our own spin-off material and we only stick to official testing site practice tests. Sessions are flexible around your needs. We can provide a realistic mock exam at the end of the program. Online Sessions can be 30 minutes, 1 hour or 2 hours each. Our needs assessment gives you a chance to communicate your own demands. Free editing and assessment of up to 10 writing submissions in a 4-7 lesson program. Free speaking assessment by sending in voice recording in the speaking sections. Feedback is given by PowerPoint voice recorded slideshows. Online sessions are through Skype, using 'share screen and sound' functions. Our teachers teach SSAT, IELTS, LPI, CELPIP, TOEFL, CELBAN and ACT preparation. We design courses for students' needs and situations. We also offer home tutoring options to Ottawa and Gatineau residents. Students can receive their lessons in their homes or in nearby libraries. As courses can book quickly, it's best to contact us at 613-447-1622 or by e-mail at info@tpstests.com as soon as you're certain you have the time to commit to a program. Trouver un tuteur est souvent un mal de tête, surtout lorsque votre test est à seulement quelques semaines. Se sentir stressé par un examen n'est pas amusant. Vous vous rendez compte probablement que si vous n'utilisez pas de tuteur, vous ne devriez pas être préparé adéquatement, mais si vous engagez un tuteur insatisfaisant, vous risquez de perdre encore plus de temps et d'argent. L'objectif de TPS est de vous fournir les cours de préparation aux tests les plus professionnels à Ottawa / Gatineau afin que vous puissiez étudier de la manière la plus efficace et la plus ciblée. Tous les enseignants sont certifiés et qualifiés. Nos enseignants enseignent SSAT, IELTS, LPI, CELPIP, TOEFL, CELBAN et ACT et conçoivent des cours autour des besoins et de la situation des étudiants. Nous offrons des cours à Ottawa. Les élèves peuvent avoir leurs leçons dans leurs maisons ou dans les bibliothèques voisines. Comme les cours peuvent réserver rapidement, il est préférable de nous contacter au 613 447 1622 ou par e-mail à info@tpstests.com dès que vous êtes certain que vous avez le temps de vous engager. We have home tutoring courses throughout the Ottawa region and online courses for students all over the world. If you have a specific course, namely CanTEST IELTS, SAT SSAT ﻿IB prep CELPIP and TOEFL, look closely at the program in tutor services﻿ or﻿ tutor courses to see what fits. Check our Find a Tutor page to see about the availability and schedule of a tutor in your area. If you have any special test programs specific to a particular school or special purposes class, please give us an e-mail at info@tpstests.com or phone at 613 4471622. Just want information on the various tests, free practice or tips ? You are also welcome to browse for the latest exam schedule updates. TPS has a policy of only using qualified teachers trained in teaching and tutoring. Teachers should have either an Education Degree and/or TESL Diploma and should demonstrate experience with international students. See our teacher qualification page for details. A growing number of options are now available for those applying for universities in Canada. TPS offers all of them and can advise you as to which one suits your needs. Each proficiency exam has its easier and more difficult sections and the best test often depends on your strengths and weaknesses. For those taking CanTEST, we do now provide speaking assessments of your recorded answers. Just make sure you have powerpoint loaded onto your computer or an equivalent if you have a Macbook. The recorded feedback and scoring is both visual and through a recording. Congratulations to all students who took the CAT4 exam and good luck for entering the IB program. For those planning on entering their children for next year, there is a second option if applying for Ashbury besides CAT4, namely SSAT. We have had a number of inquiries about CanTEST. The next date for Toronto is January 26th, and Ottawa on February 9th 2019. The standard test for entrance to IB programs is now CAT4 for Colonel By and Merrivale. TPS does offer CAT4 training and beyond it we can extend our tutorials to help with IB assignments and the various writing genres.